Vivian Maier (1926 – 2009) was an American street photographer. Maier spent most of her youth in Europe, but returned to the U.S. in 1951 where she took up work as a nanny for the rest of her life. In her free time however, she was a photographer. Consistently taking photos over the course of five decades, she would ultimately leave over 100,000 negatives. 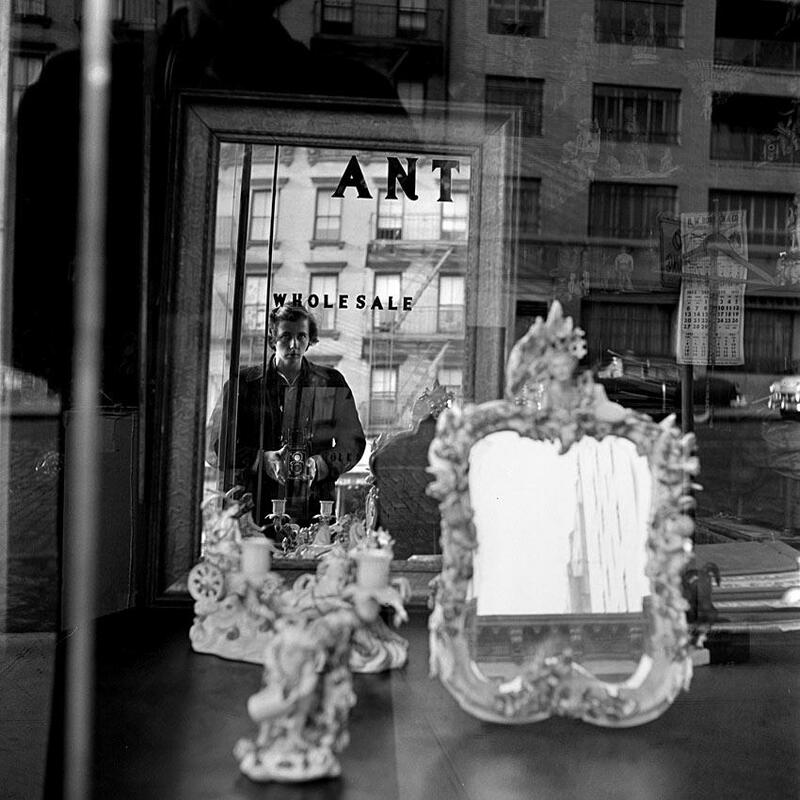 Vivian Maier: Self Portrait, 1955 © 2013 Maloof Collection, Ltd. Her photographs remained unknown and mostly undeveloped until they were discovered by a local Chicago historian and collector, John Maloof, in 2007. Following Maier’s death, her work began to receive critical acclaim. 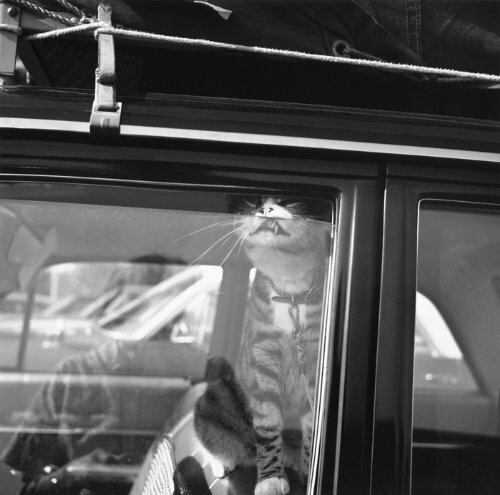 In the foreword to Vivian Maier, Street Photographer, edited by John Maloof and featuring images from his collection, Geoff Dyer approaches Maier through a consideration of her reclusiveness. “Not only was she entirely unknown to the photographic world, hardly anyone seemed to know that she even took photographs,” he writes. 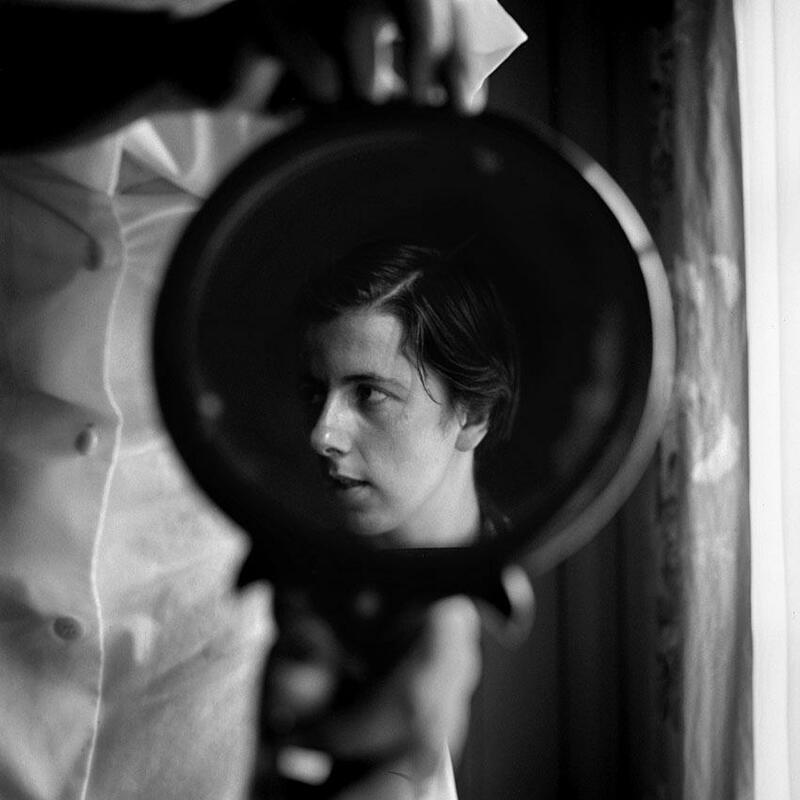 Vivian Maier: Self Portrait, 1953 © 2013 Maloof Collection, Ltd.
Vivian Maier definitively had a talent for seeing, but still – her self-portraits are enigmatic. It’s like she isn’t really there, in the picture. Having such a fantastic talent and not letting anyone know seems so very strange in a self-centered culture like ours. I wonder why she kept it to herself. What was she thinking …? Dyer finds it “unfortunate, perhaps even cruel” that she went unrecognized through her life, but can it be a choice of free will, not to have been seen, working in private? In my personal writing I’m working on a story about a person who suddenly (unexpectedly?) finds herself at the outskirts of the world. I don’t know very much about my character yet, and amongst the things I’m wondering about, is if her exclusion from the world as we know it is a result of choice or if she is expelled. In some ways the story of Maier is a parallel to what I’m working on, and not knowing my character yet, I find the contradictory views of Dyer and Maloof very-very interesting. I really need to have a closer look at Maier’s life and work – ! Thank you for this Sigrun. Vivian Maier is certainly enigmatic. There was a full-length feature about her on TV here in Britain a short while ago.There is something very poignant about her work being shown, admired and profited from after her death. In particular as she herself lived in such penury. I am not sure about the ‘true artist’ bit, nor about the ‘uninfluenced’ description either – she was a sophisticated woman despite her circumstances. And sharing is surely part of the creative experience, or is it? Thank you for commenting! In many ways I am attempted to agree with you; who would want not to be able to afford printing ones images? But, even if the funding is meager, there is a certain freedom to anonymity. Samuel Beckett, when receiving the Nobel Prize, could not be reached for comment on the prize. He was reported by his Paris publisher to be out of touch in Tunisia, and Nobel officials were unable to say whether he had received word of the award. Beckett had heard: and his reaction was to hide. Such a focus made it extremely difficult for him to work. I do not think this has to do with being a true artist or not, I believe it has to do with personality. But it is nevertheless interesting to notice that it seems almost impossible for us today, to believe in not wanting fame and recognition. fantastic! both the story of Vivian Maier’s photography and life, as your blogpost. i think i agree with Maloof for now, but i know i will have so see the documentary and i know i might change my mind; is art for the artist, or for the observer? very, very interesting indeed. Thank you! It’s a fantastic story, isn’t it?! And such marvelous images! I hope I get the chance to see the film about her in not too long. I found it really haunting of both her story and her photos when I first came across Vivian Maier. Is creating really about sharing? Not sure, but I have my doubts. Everyone has different motivation. Can over-sharing alter one’s creative mind? Not necessarily good or bad thing, but simply alter? Can an artist who was an intensely private person wished to protect that creative mind? I don’t think Vivian Maier’s story is singular, but her work sure makes her stand out. I know so many productive artists who aren’t active in showing. So much of it is because the opportunities not there. Sometimes it’s the lack of personality for networking or self-promotion, which takes good amount of time and energy, and a very necessary step for showing in today’s climate. A great comment! It made me think of Susan Cain’s book Quiet. Where she try to describe some very important differences between introverts and extroverts. Simply said: extroverts feed on social life (get more creative and inventive), for introverts it can be extremely hard to be a public figure, exhausting.